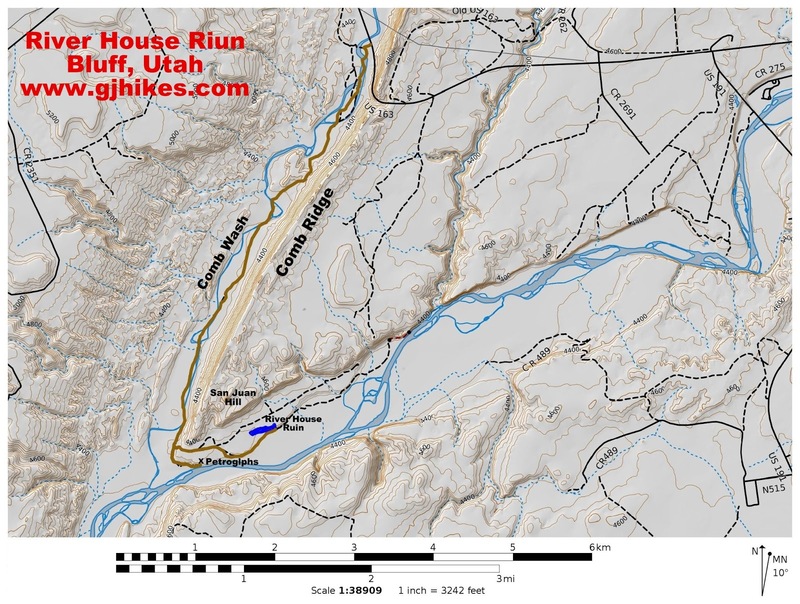 The River House Ruin is located near the San Juan River about 12 miles from Bluff, Utah on the west side of Comb Ridge. The ruin has multiple one and two story rooms, a kiva and an assortment of pictographs. Several hundred feet west of the ruin there are a couple more rooms and granaries as well as a few interesting petroglyphs that include a kokopelli and a bird. For those wanting to drive all the way to the site a high clearance 4-wheel drive vehicle is required. 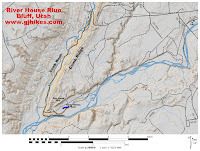 Since the site is only about 5 miles from the highway there is always the option to hike or mountain bike part or all of it. To get to the ruins from Bluff drive west on Highway 191 for about 4 miles to its junction with Highway 163. Continue straight on Highway 163 for another 3.14 miles. The highway will cross Comb Ridge and descend down the west side. 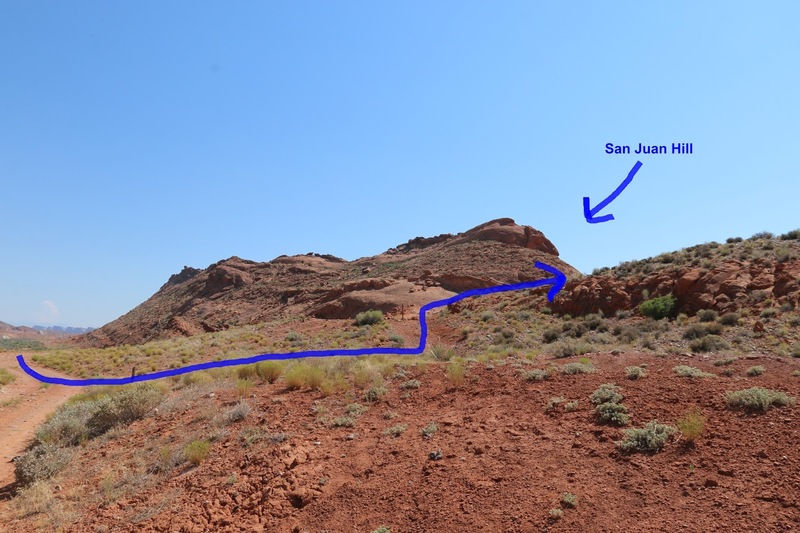 Turn left onto San Juan County Road 235 and enter Comb Wash. A high clearance 4-wheel drive vehicle is recommended at this point due to sandy washes and rocky sections. Follow the wash for about 3.8 miles where the road turns sharply to the left and climbs a steep rocky hill. The road will briefly level off at the top of the hill where you can stay to the right. The first road to the left leads to San Juan Hill while the next left fork leads elsewhere as shown on our map. From this point it is about another half mile to the ruin. Enroute the road will pass the Rincone Trading Post where it continues east around the point of a small cliff and down a section of uneven slickrock. From there the road gets much easier for the rest of the way to the ruin. We included a few pictures of the road leading to the ruin in the slideshow at the end of this post to give an idea of what you can expect. There are a lot of forks in the road as it heads down Comb Wash. It is one of those cases where 'all roads lead to Rome' so which route you take may vary. As the road approaches the 4 mile point the Hole-in-the-Rock route, which is marked by the posts with the covered wagon image on them, branches off on the left. This photo is looking at the turn from the other direction because we drove on down to check out some petroglyphs near the river. As the road climbs the hill it is a little steep and rocky. This is where a high clearance vehicle might be required. At the top of the steep section of road the Hole-in-the-Rock trail takes the left fork towards San Juan Hill. You can take a detour over there and take a look at one of the final cruxes of the Mormon Pioneers endeavor to establish a settlement in Bluff if you like. To continue to River House Ruin though you will want to bear right at the fork. The right fork leads down to the site of the old Rincone Trading Post. From here drive east past the fenced off milk house toward the water well platform. The road going in that direction isn't at all obvious until you get there. 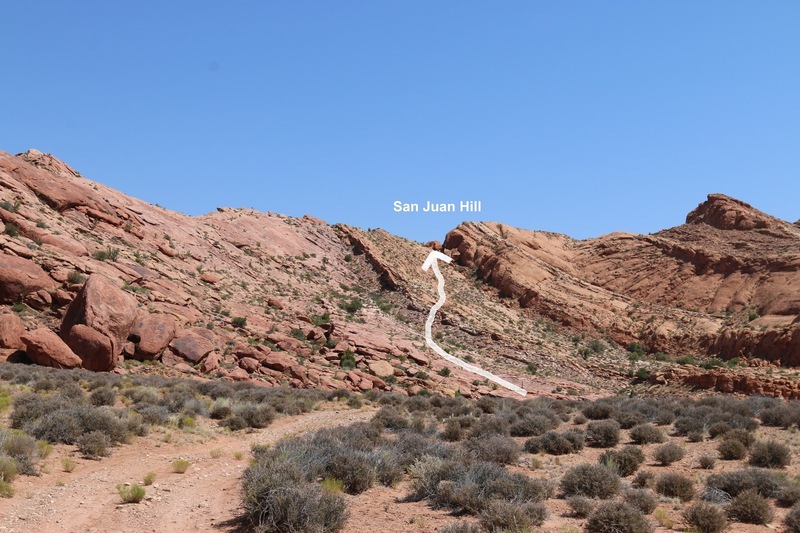 It will pass between a rocky outcrop and the water well and then drop down some uneven slickrock before leveling out for a smooth ride for the rest of the way. There is a large area to park just below the ruin where you can continue on foot. Don't be surprised to see other visitors there and no vehicles around. River House Ruin is a popular stop for river rats floating down the San Juan River. There are steps leading up to the ruins from the parking area that take a lot of work out of the climb. Be sure to stay on the trail formed by the series of steps to avoid inadvertently damaging the site. Much of the ruin is still in very good shape. Take care not to climb on the walls or do anything that would cause damage. One remarkable aspect of the site is all the work the inhabitants did chiseling steps and seats into the boulders. Using the tools that they had available it must have required a great deal of determination. This keyhole doorway is similar in design to some at Mesa Verde National Park. 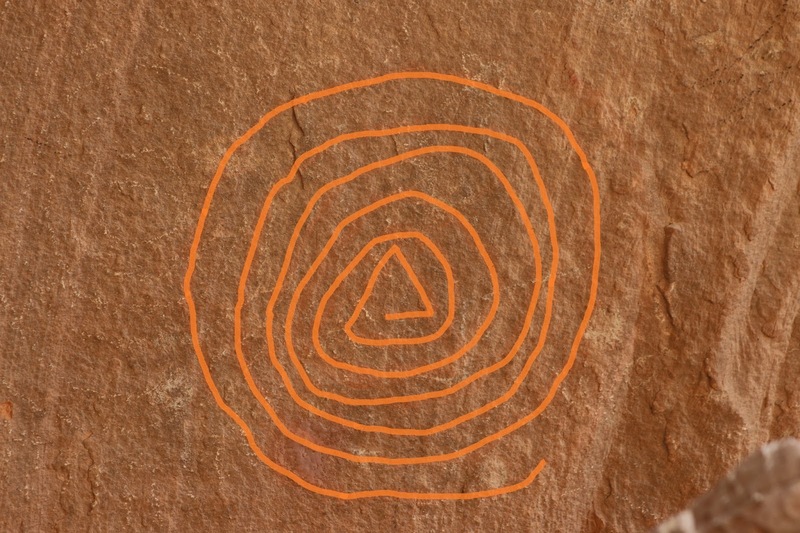 Pictographs are viewable in several places around the alcove. Some of them are getting pretty faded but they show colors of red, white and orange. This spiral caught our eye because the center of it looks like a triangle which we couldn't remember seeing anywhere previously. Whether it was intentional or if that is just the way it came out is hard to say. As you leave the alcove there is a shelf that runs westward along the cliff. As you begin there is an ammo box with more information inside. A few hundred feet further there is a very well preserved ruin tucked away within a cranny with some petroglyphs on a boulder that helps support the structure. A little further down the cliff there are one or two granaries with some very faded pictographs above them that are worth looking for. Continuing even further down the cliff you will come to a panel where there is a very well made spiral, a flute player and a bird. We continued down to the end of the shelf and looped back to the trailhead down an old road that had grooves carved into the sandstone. We also drove another half mile east on the road that leads to the ruin but we didn't drive the full length of it. As a bonus you might want to follow the road that came down Comb Wash a little further to where it ends near the San Juan River to see some more petroglyphs and a rock shelter. The road dead ends right below the spot. 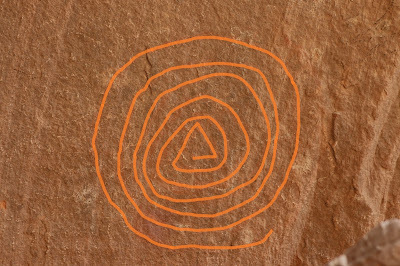 If you climb all the way up the boulder field and walk a short distance across the top toward San Juan Hill you will come to a rock shelter and some more rock art. The River House Ruin is a little difficult to get to if you don't have a suitable vehicle. We feel it is worth visiting even if you have to hike most of the way from the highway. (Bring lots of water if you do.) If you would like to see it for yourself then all you have to do is 'Take a hike'.